I posted earlier this week about the cute little mini pumpkin pies I made. I volunteered to attempt a sugar free gluten free pie for a church activity on Tuesday. I am not going gluten free, but I have been going carb free and sugar free for about a month now and I thought it would be a fun challenge. The mini pies were delicious. My neighbor dropped off my sugar free gluten free mostly healthy (for pie) at the church and when I arrived at the end of the activity to help clean up and pick up my pie dish…. it was still full. No one had even tasted it. They had put a few slices on plates and set them out on a sugar free/gluten free table…. and no one even tried it. I’m not going to lie, I kind of wanted to cry. I make really good pie. I’ve been practicing for a long time. And I’m good at it. And no one even tasted it. I put the pie in my car and took the whole thing home and in less than 24 hours my little family of three had eaten all 8 slices. And loved them all. It really is delicious, and I hope that someone on the internet looking for a pie recipe for Thanksgiving finds this post and tries it. I’ll make this pie again. But just for my family next time. Mix the salt and the almond flour together, and then cut in the butter until it is all incorporated. I did this by hand with a pastry blender (you could also use a couple of forks) because it is such a small batch. It only took a minute. When it is all mixed together add the ice water 1 TB at a time until the dough starts to stick together. When you make regular pie crust you want to be careful not to mix it too much, that’s what keeps the crust flaky. But with almond flour it doesn’t much matter. It’s more like a graham cracker crust than a regular crust. Which means you aren’t going to roll it out. Flatten small pieces of dough with a spatula or your fingers and then press them into the bottom and sides of a 9″ pie pan. Try to make the crust an even thickness all the way around the pan. For the edges, I just pressed the crust onto the lip of the pan and trimmed the excess off. Now make your filling. This is not a secret recipe. It’s not even mine. It belongs to the famous Libby and her awesome canned pumpkin. It comes straight off the back of the can, with just a few alternations. Mix all that stuff together and pour it into your pie shell. Bake at 425 degrees** for 15 minutes, and then reduce the temperature to 350 for another 40-50 minutes. Let it cool for about 2 hours before you put it in the fridge or serve it. Ok, so here’s the deal. Almond flour bakes into a dark brown a LOT faster than white flour. So I suggest using a pie crust shield. You can find these online, at a kitchen supply store, Walmart or maybe even a grocery store since it’s pie baking season. I used a shield except for the last 15 minutes and I wish I would have left it on the whole time. My crust is browner than I like, though it still tasted just fine. *One note about sugar substitute. Splenda is my preferred choice because it doesn’t have a bitter aftertaste when it is baked. You can choose whichever one you like, but according to my sugar free friend who helped me with this recipe, Splenda is the best for baking. And they didn’t even have to pay me to say that. If you are worried, I’ll just tell you, the crust doesn’t taste almondy. It has a different texture than a white flour crust, more like a graham cracker kind of crumbly/mealy texture, but it isn’t an overpowering almond flavor. I can’t wait to try this crust with a fruit filling. I might even get brave and make a sugar free/low carb version of my very favorite Rhuberry Pie. Almond flour has about a quarter the carbs of white flour, but it has a lot higher fat content. There’s always a tradeoff, isn’t there. So. Go forth. 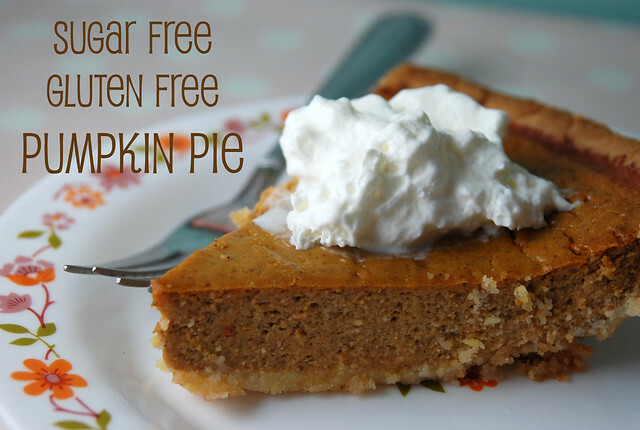 Bake pies for your celiac or carb conscious friends. But don’t take them to the church party. Save this one all for yourself. ** For my soapbox on oven temperatures and why an oven thermometor is important read this post. I have a girlfriend who is diabetic and this is just perfect. I will let you know how it goes. Thanks so much for posting your recipe — I can’t wait to try it. I’ve yet to perfect an almond flour crust and hope this one will be what I want. I’m so sorry you got that non-response at church; I know how heartbreaking it can be. You tried SO hard to provide a delicious alternative for those who need it and got no response. No one even tried it? Blech. 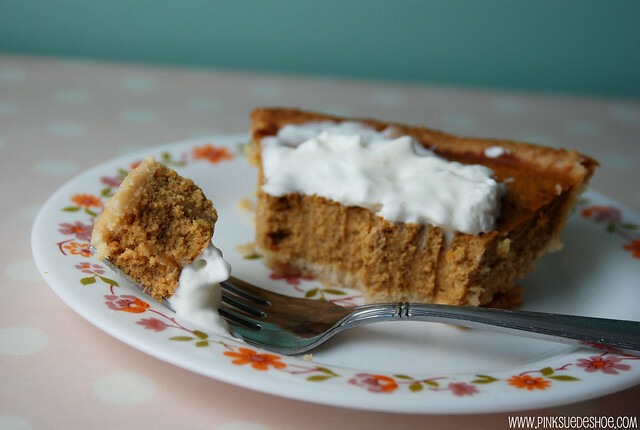 I love the crust recipe with almond flour…definitely will try that for my gluten free nice. However, Splenda is just not healthy–some say it’s even worse than aspartame and I hate to see people use it. Have you thought of trying some xylitol sugar substitutes? They are not unhealthy, although can’t be used in large quantities because it will probably upset your stomach. I don’t think there is a sugar or sugar substitute that can really claim to be “healthy.” All of them are super processed to become edible. And processed food in general is something to avoid. Of course, those trying to avoid sugar don’t eat many baked items anyway. Even sugar free cookies/pie/cakes/breads etc aren’t really on their list of things to eat often. Maybe a few times a year at the most. Splenda is relatively inexpensive and readily available. My grocery store only carries one other sugar substitue, and it’s a lot more expensive and has a reputation for a bitter aftertaste in baking. And that’s why I choose Splenda. Not that I am claiming to be an expert on sugar free living, or any other diet plan for that matter. Nobody ate your pie!? Seriously? Lameness. If I had been able to go (as planned) I totally would have tried your pie. Looks delicious. Thank you for sharing this recipe! I’m newly sugar/gluten free and didn’t have much hope for this Thanksgiving! 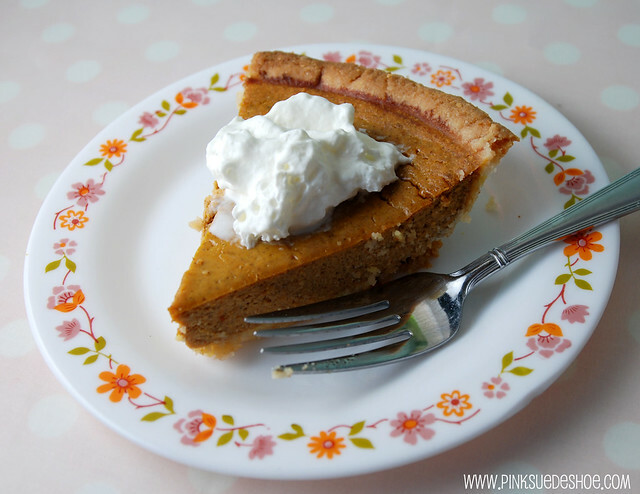 After all, how can you not have pumpking pie at Thanksgiving? I am definitely going to give this a whirl. Some people might not appreciate your efforts, but I certainly do! I would have eaten your pie. I believe in its deliciousness. 🙂 I passed this along to my GF friends, so hopefully someone who actually needs to can enjoy this too. You are amazing! This recipe came at just the right time for me. I am cooking pies for work tomorrow & there was a silent request for sugar-gluten free pumpkin pie. This is great! TY! It’s possible people didn’t eat the pie because they saw it labelled sugar-free and gluten-free and thought they should leave it for the people who can’t eat sugar/gluten. I’ve seen that happen before. If no one will eat it there, bring it here to us in Toronto! We’ll eat it at a Church activity! 🙂 Sounds delicious! I understand how you felt, I have Celiac and whenever I bring deserts to a function I mark them gluten free, and very little gets eaten. So now it doesn’t bother me at all, at least I can have a desert at the function AND more for me when I get home. There are several things I make that my family can’t tell the difference. In fact my husband likes my brownies better than any other kind. I do make the almond crust, but my favorite is. 1 1/2 c. Bob’s Red Mill all purpose GF flour, 1/2 c. featherlight mix, 1/2 tsp. xantham gum, 2 Tbs. sugar, 1/2 tsp salt, 6 oz. creame cheese (softened), 1 cup real butter (softened) Mix dry ingreedients, set aside. With mixer on low mix cream cheese and butter together, add dry ingredients and mix just until the dough clumps together. Divide in half, wrap in saran, and refrigerate for 30 t0 60 min. After you roll it out and put it in the pie plate, chill again for about 20 minutes then procede as you would any other pie crust. Featherlight mix 1 c. rice flour, 1 c. cornstarch, 1 c. tapioca starch, 1 Tbs. potato starch flour and mix all together. From “Life Tastes Good Again”. I have tried many mixtures since I was diagnosed 8 years ago, and that has been my favorite. I find I can substitut it in most recipies, but always use some xanthan gum. Sorry the crust is not sugar free. Does anybody know if we can substitute splenda with honey to make it healthier? My sister in laws mom always uses honey in her pumpkin pies. I have never tried it, but it would work out just fine, though it will change the taste a bit. Good luck! Loved reading all of your comments. I am the Pie Lady in Hollywood, Florida. I just started investigating the gluten free aspects of pie making but, have been doing the sugar-free pies since the past holidays, I get sooo many requests. I don’t see you mentioning BLUE AGAVE instead of sugar. Works beautifully, easy to find now in the grocery stores. I will be trying the recipes! You were FIRST on my google search for a “gluten free/sugar free pumpkin pie”. Thank you and congrats! There’s not a whole lot out there in the sugar free arena also. Alas, I do not do Splenda either though I agree with you whole heartily – as my Bible says “all things in moderation”. I am going to try it with Coconut Palm Sugar, a much slower processed sugar and so has a much lower glycemic affect. Palm sugar is not good for lighter tasting desserts because it has a richer caramel type sweetness…but it tastes great with anything that has a cinnamon or spice flavor. Going to make it this Thanksgiving and will check back. Thanks and bless. Christine @profitandgive. I found Jillian’s frozen wheat free gluten free pie shell at my local health food store. May have it at whole foods? This was great. I am definitely having to eat sugar free as I am Type 1 diabetic. This is low enough in carbs that I was actually able to enjoy without the “carb high” after I ooohhhed and ahhed over it. Thanks so much.